The year was 1878, the rush for land was on, and among the many who sought a new life in the new land were the Ingalls; Charles, his young wife; Caroline, and their three daughters; Mary, Laura and Carrie. Packing their few belongings into a wagon, they said goodbye to friends an... read full description below. The year was 1878, the rush for land was on, and among the many who sought a new life in the new land were the Ingalls; Charles, his young wife; Caroline, and their three daughters; Mary, Laura and Carrie. Packing their few belongings into a wagon, they said goodbye to friends and relatives and joined the trek westward that would lead them to their new home in Plum Creek, on the plains of Minnesota. The Ingalls, pursuing the American dream, come to realise that they will have to fight for every inch of soil they turn...for every foot of ground they plant. Fight against disease, nature, local prejudices, and the rigours of a hostile environment. 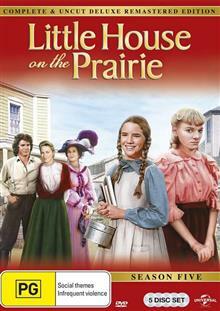 The episodic adventures of the Ingalls family are based on the remembrances of the late Laura Ingalls Wilder, whose Little House books paint a realistic picture of pioneer life on the western fringes of the country over 100 years ago. This five disc collection features all 24 Episodes from season 5.